If you wander over the fairground it is impossible to overlook the Convention Center CC. Some visitors compare the futuristic building with a “flying saucer”. Behind the modern front there are many rooms that perfectly suit for smaller and major events. Three giant halls are the centerpiece of the building. 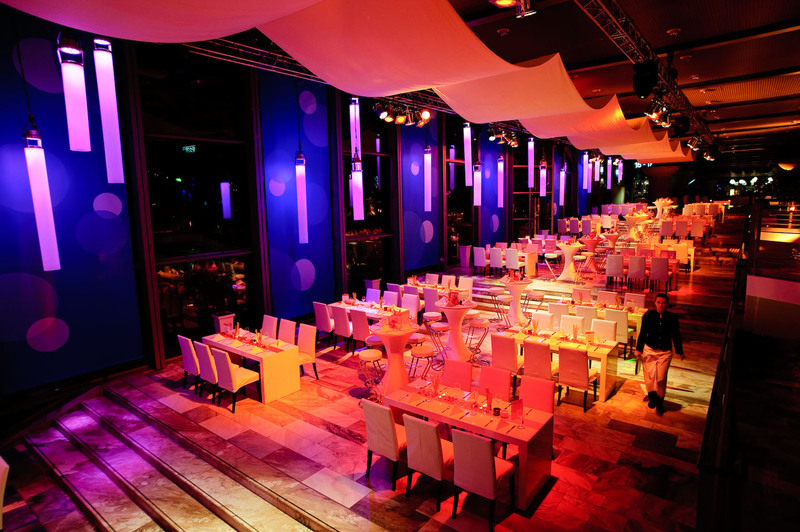 Hall 1 suits for performances and concerts with up to 1.140 guests. Rows of tables posses a capacity for 568 persons. Glass fronts guarantee optimal day light. A darkening is also possible without problems. If required the hall can be divided into two equal parts. Hall 2 has a capacity for events with up to 852 visitors. The spacious stage with a bordering backstage area is perfect for live-performances. Hall 3 possesses a capacity for maximal 521 guests in seating rows. Also hall 3 can be divided into two separate rooms. With over 100 sq m of space halls 11 to 18 suit perfectly for events with up to 72 persons. Halls 13 and 14 as well as 15 and 16 can be connected so that events with up to 132 guests are possible. Rooms 101 to 113 are smaller (30, 60 or 90 sq m) than the others but also very comfortable. These rooms suit for meetings or as VIP lounges. Of course the ca. 2.000 sq m foyer is available for events. It is the connecting piece of the halls upstairs. A perfect place for a stylish welcoming of your visitors. Downstairs there are eight further rooms that offer areas of 113 sq m and 265 sq m.
No matter for what room you decide: We guarantee professional presentation technology and an exclusive catering. We are looking forward to welcoming you at the Convention Center CC at the fairground in Hanover.